How many times have you had meatballs that had the texture of a lacrosse ball, dry and rubbery. Add to that they are usually balls of beef with all the taste of fast food hamburger patties. Some people solve the problem by using Italian sausage chunks instead of meatballs. It definitely has a good flavour but does tend to get a little hard when cooked in sauce. I decided I could do better by making a more tender meatball with some Italian sausage seasonings. There would be problems with this though. One way of making ground meat moister and more tender is using a panade (bread crumbs softened in milk). The problem is that it makes the balls softer. I decided to make a very moist ball. 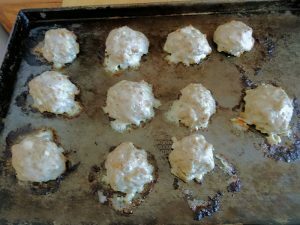 I wouldn’t be able to cook the balls in a fry pan but I could get around that by baking them. 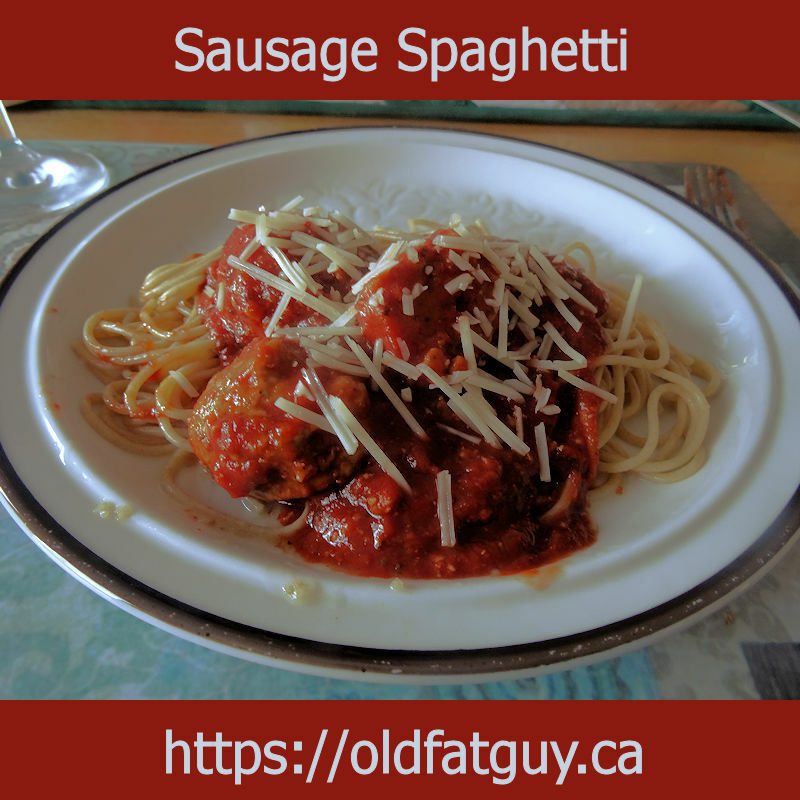 I would further allow some of the taste into the sauce by simmering the meatballs in a classic Italian tomato gravy. Preheat the oven to 500 F.
Tear two slices of bread into chunks in a bowl. Pour 75 ml (1/3 ) cup of milk over the bread and mash until it is a paste. Add 600 grams (1 1/2 pound) ground pork and mix thoroughly. The mixture will be soft and moist. Spray a baking sheet with baking spray. Drop golf ball sized meat onto the baking sheet. Spray the surface of the meat with baking spray. Bake the meatballs for 15 minutes (they will flatten a little). Make sure the internal temperature is over 160 F. Set the tray aside. Bring to a boil stirring constantly. Reduce heat and simmer for 15 minutes. Add the meatballs and simmer for 20 minutes. Serve over spaghetti cooked to the package directions. This is just what I hoped for. The meatballs were tasty and soft but held together well. The sauce was rich and flavourful. It had the taste of Italian sausage that added to the overall taste. It was even better the next day. Tear bread slices into chunks in a bowl. Pour milk over bread and mash into a paste with a fork. Add the milk, salt, pepper, Parmesan, eggs, garlic, oregano, fennel seed, skim milk powder, lemon juice, red wine and olive oil. Mix well. Add the pork and mix well. Spray baking sheets with baking spray. Drop golf ball size balls of meat onto the trays. Bake for 15 minutes making sure the internal temperature of the meat is over 160 F. Set the trays aside. Heat the olive oil in a Dutch oven over medium high heat until shimmering. Saute the garlic for a few seconds just until it starts to colour..
Add the rest of the sauce ingredients and stir. Bring to a boil, stirring constantly. Reduce heat and simmer for 15 minutes.